Ozsun offers Sydney a comprehensive range of retractable awnings, blinds and retractable roof systems for shading patios, decks and windows. 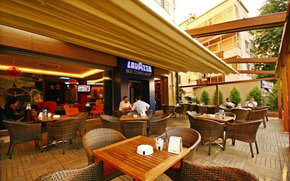 We provide awnings and blinds for both residential and commercial applications such as restaurants and cafes. 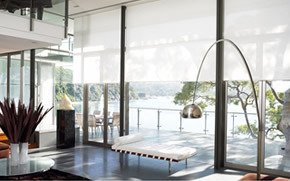 We’re dedicated to giving Sydney the very best awnings, blinds and shade systems, with a focus on quality, innovation and value. We specialize in German made and designed retractable awnings and external blinds. Ozsun Products Pty Ltd incorporating Smith Copeland & Co. (est. 1892) is a long established awning and blind business. Our factory is located at St Peters in Sydney. Ozsun provides a complete design and installation service in Sydney, from the Northern Beaches to the Eastern Suburbs and Inner West down to Cronulla and Sutherland Shire. 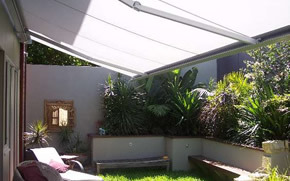 We also ship awnings and blinds anywhere in Australia. From our initial free on site consultation and quotation through to the project management and installation we pride ourselves on customer service. Call us for a free quotation and let one of our experienced consultants help you create an outdoor room with a retractable folding arm awning or retractable roof system. Folding arm awnings are ideal as a roll away cover for a patio, deck, balcony or commercial applications such as restaurants. A folding arm awning requires no posts and provides protection from the sun or light rain. Retractable roof awnings are a concertina style retractable roof system that fold the fabric back in pleats. Waterproof and engineered to withstand wind speeds of up to 117km/hr (W32). Our retractable roof systems allow you to create an outdoor room for all seasons.